On a rainy Friday night, the Cartersville Purple Hurricanes traveled to Baldwin High School to defeat the Braves 42-13. 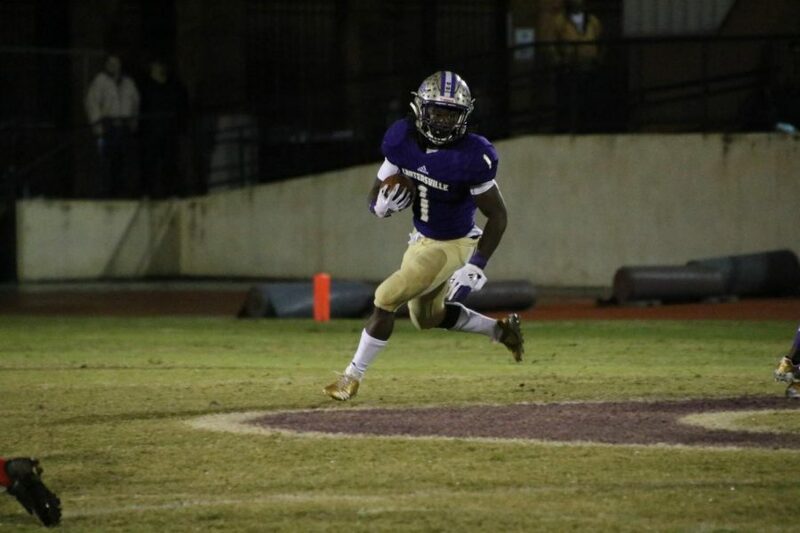 Baldwin started out hot, returning the opening kickoff to the Cartersville 39 yard line. They continued the drive with an 11 yard run and a 15 yard pass, but all for nothing. Two delay of game penalties and a big sack by senior linebacker Tristan Carlton put the Braves in a third and long situation. They ran a screen pass and it looked as if running back Noah Hill would get the first down, but after a big hit Hill fumbled the ball and Cartersville recovered. Unfortunately, the Canes couldn’t capitalize on the turnover after they failed to move the ball on offense. On fourth down, Cartersville sent out the punting unit, where senior punter Ricardo Torres dropped back to throw. He got the ball out in the flat to senior Sunni Moorehead, but well short of the first down. Baldwin got the ball back on Cartersville’s 20 yard line and, and after penalties, scored on a 21-yard screen pass from freshman quarterback Derrick Lewis to junior running back Noah Hill. The point after try, however, was blocked. The Canes once again failed to move the ball and found themselves in a 4th and short situation. Cartersville lined up to go for it, but then Quarterback Tee Webb punted the ball inside the Baldwin 20 yard line, ending the first quarter with the Braves up 6-0. Baldwin continued to dominate the Cartersville D as a big play drive got them on the board once again. After a 29-yard run by senior Shondraus King and another 21-yard screen pass to Noah Hill, the Braves punched it in on an 11-yard run by junior fullback Zaahir Salahuddin. Dropped passes led to another Cartersville punt, but this time the defense would not let Baldwin capitalize. Running back Noah Hill gained some ground, but the Canes’ D decided they had had enough. After a big tackle for loss by sophomore defensive back Amari Orr, the Braves were forced to punt on 4th and 19. Baldwin lined up to punt, but the snap was botched and Cartersville got the ball on the Baldwin 30 yard line. Cartersville relied on senior running back Marcus Gary for this drive (and a large percentage of the rest of the game), to get them on the board. After an 8-yard run and a 14-yard run, Gary pounded his way in on a 4-yard touchdown run. Baldwin looked as if they would score on the ensuing possession after Derrick Lewis threw an 18-yard pass to senior receiver Jailyn Battle, but a bad snap on third down resulted in a 12-yard loss and a punt on the next play. Cartersville took it to the locker room after only a couple of snaps ended the first half. The Canes came out on fire in the second half and never looked back. After an 8-yard run by Gary, Tee Webb threw a 62-yard touchdown pass to senior receiver Trendon Horton. Horton beat his man and Webb delivered the ball right on the money for the first of many scores in the second half. The Canes’ D responded to the offense’s hot start with defensive end Isaiah Chaney recovering a Baldwin fumble to put the offense in great field position. After a 15-yard penalty on Baldwin, Marcus Gary finished the drive with a 6-yard touchdown run. The Cartersville D stepped up again when a huge deflection by sophomore defensive back Evan Slocum brought up 4th down and a punt. Cartersville continued to get it done with Gary. After some solid runs, the senior running back broke free for a 52-yard rushing touchdown, his third and final score of the night. An illegal block in the back and an unsportsmanlike conduct penalty brought a Baldwin kick return touchdown all the way back to the Braves’ 6 yard line. The elite Cartersville defense kept up the momentum as junior defensive back Marquail Coaxum intercepted Derrick Lewis for a pick six. Lewis continued to throw away Baldwin’s chances with another interception on the next drive to Evan Slocum. After some big gains by Gary, Tee Webb scored himself on a 3-yard rushing touchdown, the final score of the night. Cartersville scored 42 unanswered points after being down 13-0. Marcus Gary led the comeback with a season high 29 carries for 196 yards and 3 touchdowns. Penalties killed Baldwin all night as they couldn’t seem to keep their emotions in check. The Canes will host Marist next week in the semifinals of the 4A GHSA State Playoffs.